As I watched the video of General Martin Demsey announcing his endorsement of women in combat, I waited. I waited for the backlash. The backlash from the misogynistic males who already have a problem with any woman being in the service, unless she works in administration or the chow hall. The backlash from the “bible thumpers” pleading that we “think of the babies” and not place their mothers in harms way. But most of all, I waited for the feminists. The feminists always give the most entertaining responses to these new developments of the progression of females in the military. Controversial, passionate and interesting are their responses. So I was shocked to see some of my favorite girl power-based columnists and writers voting against the end of the ban. Well, I have news for you ladies: I’m already a woman in combat. 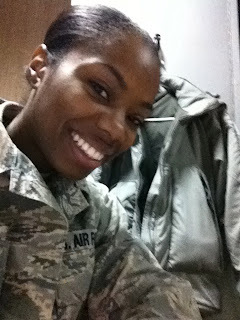 As a munitions specialist in the Air Force, I work with bombs, missiles and all things dangerous. This is what I do and have done for the past 12 years. I’m also an African-American women within this male-heavy AFSC, which makes me part of 3% of the munitions troops worldwide. With deployments (plural) under my belt, I can safely say that I’m in harms way every time I leave. If the enemy ever gets smart enough, my shop would be the first thing to go. Built-up live munitions just hanging out in open areas seems like the perfect thing to blow up in a war, so while I’m in that space, this is what I think of. As I build up yet another structure piercing air-to-ground bomb, I take it’s potential of destruction seriously. I’m in danger every time I work. Period. When a mortar hit the back of the tent while I worked my 12 hour shift on Christmas Day, almost blowing my whole crew to bits, I wasn’t thinking how lucky I was to not be a paratrooper. I was thinking that death was here and this was it. Don’t look past the obvious; we’ve been sending women into danger for all of the years of this war. My thought is that these feminists speaking out think that they are doing us a favor. Please know this is not the case. Others are expressing that the General made his decision because of pressure to re-create our military to make it more “female friendly.” This is also not the case. I’ve heard comments most of my career stating “we don’t feel sorry for you or your children” and ” you chose this lifestyle, so live with it.” Well, I have. I also guarantee that the women who will pursue the military jobs that we were once banned from will do the same. Put down your pitchforks and just offer support, not oppression or judgement. That’s all we’ve ever asked for.